How to use Stripline in ejChart? Stripline is used to highlight specific sections of a chart area. 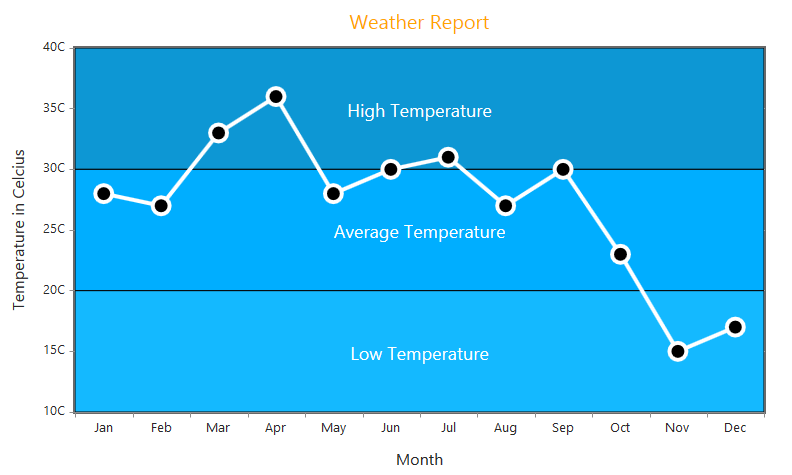 This is most commonly used in sales report, monthly report, weather report and temperature report. Essential Chart supports to create more than one Stripline horizontally or vertically and customize its color, zOrder, text and font etc, to differentiate the chart data. Stripline can be implemented within the primary axis either horizontally or vertically for a given range. To draw Stripline for an axis in chart area, you need to create Stripline array object for that axis and provide start and end range for Stripline. You can add text for Stripline using text property and customize font and color of the Stripline. You can refer to the following code example.